Wake Forest University is located in the city of Winston-Salem, county of Forsyth, in the Piedmont section of North Carolina, about 75 miles from the Blue Ridge Mountains and 225 miles from the beaches of the Atlantic Ocean. The metropolitan region of Winston-Salem/Forsyth County has a population of approximately 234,349 residence and the fourth largest city in North Carolina. The climate is moderate with an average summer temperature of 78 degrees, and an average winter temperature of 40 degrees. Rainfall is well distributed throughout the year, with a few days of snow. With more than 3,500 acres of park space, visitors and residents alike will be able to find plenty of outdoor activities for entertainment. Activities range from walking, swimming, biking, playing tennis or golf, hiking through local woodland areas or scenic mountain trails, or just relaxing and enjoying a picnic in the great outdoors in one of the city parks. In addition to the sporting events of Wake Forest University, Winston-Salem boasts centralized sporting facilities in one convenient location. Minor league baseball, university football, basketball and soccer facilities are located in and around the Lawrence Joel Veterans Memorial Coliseum (LJVM) and the Dixie Classic Fairgrounds just minutes from the main university campus. 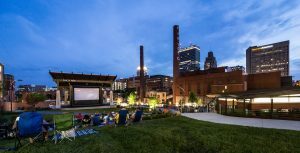 Members of the community attend an open air film presentation in the new Bailey Park in downtown Winston-Salem on Thursday, June 18, 2015. 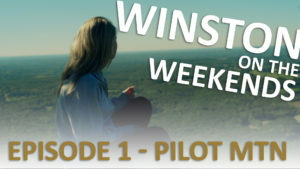 The skyline of Winston-Salem is in the background. The city is also home to the Piedmont Opera, Winston-Salem Symphony Orchestra, the Southeastern Center for Contemporary Arts (SECCA), Reynolda House and gardens, NCSA Stevens Center, Sawthooth School for Visual Art, Museum of Early Southern Decorative Arts (MESDA), and Old Salem, the site of the Moravian town founded in 1766, from which the present city grew. The city’s downtown area is an active vital neighborhood of cultural events and city living. The center of the city is home to the Stevens Center for the Performing Arts and the Sawtooth School for Visual Arts. During the summer months, music festivals and gallery exhibitions welcome the public to hours of enjoyment. Condominiums, apartments, restaurants, art galleries, sidewalk shopping, and live music bring residents to the downtown year round; while the sidewalk cafes and coffeehouses with their free wireless connections attract the young and the young at heart. The WFU Graduate School of Arts and Sciences consists of four campus locations. The Reynolda Campus is located on Reynolda Road in the northwest section of Winston-Salem and houses programs of study in the arts and sciences. The Historic Brookstown space also houses programs of study in the arts and sciences but is located in downtown Winston-Salem. The third location is our Bowman Gray Campus which is located in downtown Winston-Salem at the Innovation Quarter, and it houses our biomedical sciences graduate programs. Finally, the School of Medicine is home to the Wake Forest Baptist Medical Center (WFBMC). The WFBMC is located on Medical Center Blvd, 1 mile from downtown Winston-Salem.